A fairy tale is a story about magic and legendary deeds. It sometimes contains elves, fairies, witches or dragons. Cinderella - Her evil stepmother and stepsisters would not let her go to the ball, but her fairy godmother made it happen with magic. She danced with the prince and they fell in love. Since she had to leave by midnight, she ran and lost one slipper. The prince found the slipper and searched for her. After he found her, they were married and lived happily ever after. Elves and the Shoemaker - A shoemaker and his wife were very poor. One day they ran out of leather so they went to bed. In the morning, they found a pair of shoes and a passerby bought them. The next night, another pair of shoes appeared. The third night they hid and saw two elves making shoes. In gratitude, they made clothes for the elves, as winter was approaching. The elves were very happy and went on to help someone else. Emperor's New Clothes - A vain emperor hired two people to make him some new clothes. The tricked him, telling him the cloth was not visible to people unfit for his position or who were very stupid. At first the people pretended to see the clothes, but a child says that he is not wearing clothes and people start to agree. The emperor realized he was swindled but continues the parade anyway. Frog-Prince - A frog asked a princess why she was crying and she replied that she had dropped her golden ball into the pond. She promised anything if he would get it for her. He did and asked to eat from her plate, live in the castle, and that she be his friend. She did and he turned into a prince as he had been under a spell from a witch. They married and lived happily ever after. The Gingerbread Man - A little old woman baked a gingerbread man and when she took him out of the oven, he ran away. The woman and her husband chased him, as well as the pig, cow and horse. No one could catch him. He came to a river and a sly fox told him he could jump on his tail and he would take him across. He did and the fox went deeper and the gingerbread man had to jump on his back and then on his nose. When he got to his nose, the fox ate him. Goldilocks and the Three Bears - Goldilocks saw a cabin in the woods and entered, she found three bowls of porridge, one was too cold, one too hot and the other just right, so she ate it. She found three chairs, one to hard, one too soft, and the little one was just right and she sat in it and broke it. Of the three beds, one was too hard, one too soft and one just right, so she fell asleep. The bears came home and frightened her and she ran away. Hansel and Gretel - The two childrens' wicked stepmother took them into the forest and left them there. They came upon a house made of sweets and they ate some. The evil witch that lived there locked them in a cage and was going to make a soup out of them. Gretel got out of the cage and pushed the witch into the boiling water. The children found treasure there and took it home and they were never hungry again. Jack and the Bean Stalk - Jack took the family cow to sell and traded it for magic beans. His mother was angry and threw them out of the window. The next morning a giant beanstalk had grown. He climbed the beanstalk and found a giant there who had gold coins. Jack stole them and took them home. Later, Jack returned and saw a hen that laid golden eggs and he stole that, too. The third time he tried to steal a magic harp and the harp cried out. The giant chased Jack down the beanstalk, Jack chopped it down and the giant died. 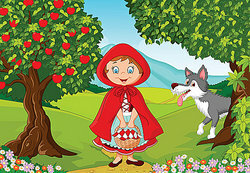 Little Red Riding Hood - Little Red Riding Hood's mother sent her to Grandma's house with a basket of goodies and told her not to talk to strangers. A wolf asked here where she was going and she told him. He went to Grandma's house, locked Grandma in the cupboard and put on her clothes. Little Red Riding Hood was surprised at Grandma's eyes, ears and teeth, remarking on how big they were. The wolf said the teeth were better for eating and he pounced. She screamed, some woodcutters heard her cry and rescued her. The Pied Piper of Hamelin - The town of Hamlyn was overrun with rats. The Pied Piper offered to get rid of the rats for 50 pounds and the mayor agreed. He started playing his pipe. The rats followed him and he led them into the harbor and they died. He went back for his money but the mayor only paid 20 pounds. The Pied Piper wanted to teach him a lesson, so he played his pipe and all the children followed him out of town. The mayor sent men to find the children but they could not find them. Pinocchio - Gepetto was a poor carpenter who carved a puppet that became live. He named him Pinocchio and sent him to school. One day Pinocchio joined a puppet show but the puppet master wanted him for firewood. He begged to be spared and told him about his poor father. He was spared and the puppet master gave him five gold coins for his father. Princess and the Pea - A prince wanted to make sure he married a real princess. He devised a test for an unexpected guest who claimed she was a princess. He placed a pea beneath 20 mattresses and 20 feather beds thinking only a princess could be sensitive enough to feel the small pea. The next morning, hte princess said she did not sleep because of something hard in her bed. The two were married and lived happily everafter. Sleeping Beauty - A princess was born and an old fairy placed a spell that she would prick her finger on a spindle when she was 16 and die. The good fairies made another spell so that she would only sleep for 100 years and a prince would awaken her. When she was 16, the witch, disguised as an old lady, showed her a spinning wheel and she touched the spindle and fell asleep. The good fairies decided to make everyone sleep. After 100 years, a prince from another land found her and kissed her. Everyone awoke, they married and lived happily every after. Snow White and the Seven Dwarfs - Snow White's evil stepmother wanted to be the fairest in the land and was jealous of Snow White's beauty. The stepmother ordered Snow White to be killed but the huntsman spared her life. Snow White came upon a cottage that belonged to seven dwarfs and they let her stay. Soon the wicked stepmother found her, disguised herself and took her a poison apple. She fell into a deep sleep and the dwarfs made a crystal coffin for her. Prince Charming came by the cottage, saw her, kissed her, and she awoke. They were married and lived happily ever after. Three Little Pigs - One pig built a house of straw and the second a house of sticks, because they were lazy. The third took the time to build a strong house with bricks. When the big bad wolf came, he huffed and puffed and blew the straw and stick houses down. He couldn't blow down the brick house and the pigs put a pot of boiling water in the fireplace. The wolf fell into it and died. Thumbelina - A woman wished for a baby, even a tiny one. A fairy granted her wish and gave her a seed to plant. When it bloomed, a tiny baby was inside. A toad fell in love with the baby and kidnapped her. A swallow rescued the baby and took her away to warmer lands. There, Thumbelina found another tiny person just like her. He asked her to marry him and she became queen of the flowers. Ugly Duckling - One duckling did not look like the others and he was sad. He decided to run away and came across a cottage. He stayed there for a while but the children scared him. He left and spent the winter in the pond. In the spring, he saw his reflection and realized he was a swan. Now you have seen lots of examples of stories considered fairy tales. "Examples of Fairy Tales." YourDictionary, n.d. Web. 18 April 2019. <https://examples.yourdictionary.com/examples-of-fairy-tales.html>.